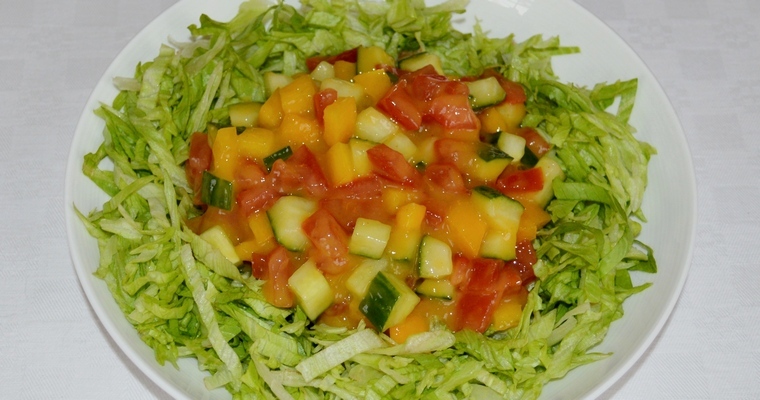 Enjoy a taste of the Caribbean with this simple salad, dressed with a sweet mango puree and zingy lime juice. An ideal accompaniment to spicy jerk dishes. This recipe is for a nice cooling salad, which works well against the fruity heat of jerk dishes. But if you like, you can add a pinch of chilli powder for a bit of heat, or some alliums like chopped chives, spring onions or red onion for a bit of bite. Make the mango puree. Cut off both cheeks of the mango, as close to the pit as possible. Place the two halves cut-side up. Cut cross-hatches down to the peel, but not through it. Turn inside out and peel off the cubes. Trim off any extra flesh left around the pit. Place the cut mango pieces in the small bowl of a food processor with half the lime juice. Blitz until smooth. Make the salad. Peel the cucumber and chop in half lengthways. Gouge out the watery seeds with a teaspoon and discard. Chop the tomatoes into four segments. Cut loose the seeds where they are attached at the top. Scoop out the seeds and white central bits with your thumb and discard. Slice off the top of the bell pepper and discard. Quarter lengthways, and cut out the seeds and membrane. Chop the cucumber, tomato and bell pepper into roughly 1 cm cubes. Combine in a bowl. Pour over the mango puree, and stir with a spoon until evenly coated. Shred the iceberg lettuce. Stack several leaves at a time on top of each other, and roll into a tight cigar shape. Keeping hold of the cigar with one hand, slice finely with a large knife. Make the dressing. Combine the salad dressing ingredients in a jam jar (olive oil, white wine vinegar, salt and black pepper), and shake vigorously until blended. Place the shredded lettuce in a large serving bowl. 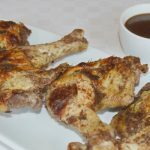 Pour over the dressing just before serving, and toss until evenly coated using your hands. Make a well in the centre, and spoon in the mango mix.